Moving the Needle: Angel Pagan walks off with a homer, +.430 WPA. It was a hard-fought battle for the Mets, who found themselves down 4-0 after two and a half. They halved that lead in the bottom half, though, and then tied the score with a two-run shot in the fifth. 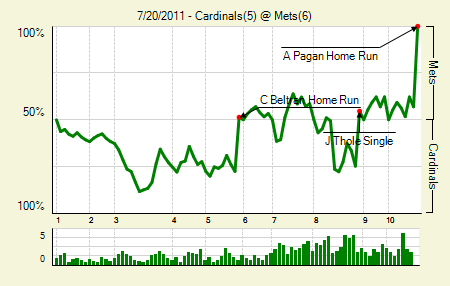 They then traded runs with the Cards in the eighth, which ultimately sent the game to extras. With one out in the 10th, Angel Pagan lifted the first pitch he saw deep into the right field seats for the game-winning run. Carlos Beltran: 1 for 4, 1 HR, 1 BB. Pumping up that trade value again, I see. His two-run shot tied the game in the fifth. 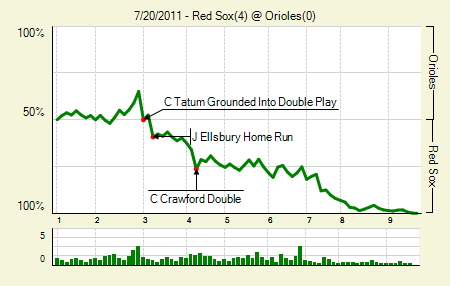 Moving the Needle: Craig Tatum hits into a twin killing in the second, -.152 WPA. Oftentimes we see the biggest WPA swing come on a double play, but it’s usually late in a tight contest. This one came in the second inning while the score was 0-0, though Baltimore did have the bases loaded and one out. Andrew Miller had walked the three batters prior to Tatum, and went to 3-1 on Tatum before he induced a few fouls and then the killer ground ball. The Red Sox took it from there, scoring runs one at a time on their way to a relatively easy 4-0 victory. Jacoby Ellsbury: 2 for 4, 2 HR, 1 BB. That’s 15 homers in 433 PA this season. He hit just 20 homers in 1,513 PA prior to this season. Carl Crawford: 2 for 3, 1 2B. 1 BB. The walk drove in a run. 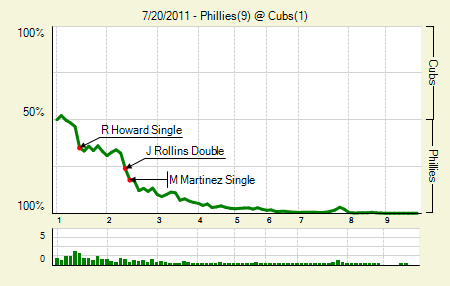 Moving the Needle: Ryan Howard gets the Phillies on the board in the first, +.114 WPA. Sometimes, the shift backfires. The Cubs had three infielders on the left side when the Phillies had runners on first and second with one out in the first. Howard hit a little nubber to where the shortstop would have been, had he been playing double play depth on any other hitter. But because it was Howard it sneaked through for an RBI single. The Phillies picked up one more in the first, and then tacked on three in the second and another in the third on their way to a big win in Chicago. Jimmy Rollins: 3 for 5, 1 2B. 2 HR. He scored four and drove in three, homering from both sides of the plate. Vance Worley: 8 IP, 4 H, 1 R, 2 BB, 7 K. He’s become something of a cult figure in Philadelphia, and with performances like this it’s easy to understand why. Moving the Needle: Victor Martinez doubles home a pair to give the Tigers the lead, +.248 WPA. In the sixth Hideki Matsui homered, his 500th as a professional, to give the A’s a 3-2 lead. 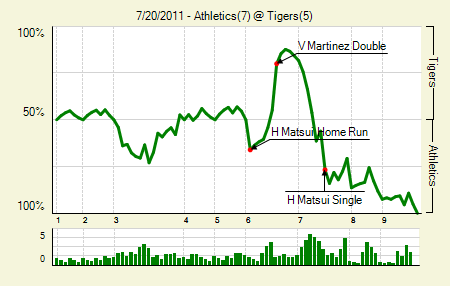 But in the bottom half the Tigers got two singles followed by Martinez’s double, giving them the lead. They’d take at two-run lead eventually, but that didn’t stop the A’s comeback machine. Three straight walks started the seventh, and then three singles and a sac fly made for a big comeback. Joaqin Benoit is the goat in this one; he came in the with bases loaded, but he let the game get way out of hand. Hideki Matsui: 3 for 4, 1 HR. He drove in three total. And, again, 500 home runs as a professional baseball player. 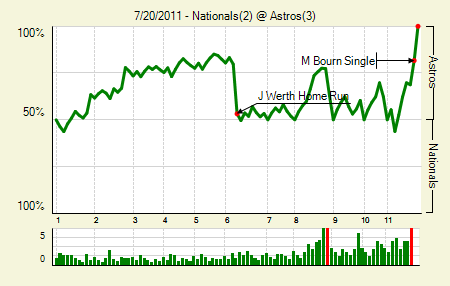 Moving the Needle: Jayson Werth homers to tie the game at two, +.265 WPA. The game might have ended in walk-off fashion, but the Astros made it interesting first. They took a 2-0 lead after two, but the Nats got back into it when Werth socked a two-run bomb into the last row of the Crawford Boxes. The Astros didn’t do much until the 11th, when they went single-sacrifice-single before Jason Michaels singled home the winning run. Brett Myers: 7 IP, 8 H, 2 R, 2 BB, 4 K. That’s stellar when compared to his average start this season. Though he’s still not getting traded. Not with that contract. Hunter Pence: 1 for 2, 1 3B, 3 BB. His excellent, if BABIP-heavy, season continues. Moving the Needle: Ben Revere’s misplayed fly ball costs the Twins a run, -.215 WPA. This play was unfortunate, to say the least. In the fourth, down 2-0, the Indians loaded the bases on a pair of singles and a walk. With one out Matt LaPorta hit a deep fly to center that would have easily scored the runner from third. But Revere dropped the ball after it hit his mitt, which allowed the runner from second to score as well. Yet another run scored on a grounder that inning, giving the Indians the lead. Revere’s teammates took pity on him, apparently, as they scored two of their own in the bottom half to re-take the lead. Alexi Casilla: 3 for 4, 2 2B. He scored twice and drove in a run. Lonnie Chisenhall: 2 for 4, 1 HR. He’s off to a slow start, but he’s shown signs of life at times. And hey, half of his 12 hits have gone for extra bases. Moving the Needle: Ryan Ludwick keeps it going in the first with a two-run double, +.126 WPA. The first couple of innings did not go so well for the Marlins. Will Venable provided a glimpse of things to come when he homered to lead off the game. A single and a walk followed, and then Ludwick laced one into the right-center field gap to bring home the runners. 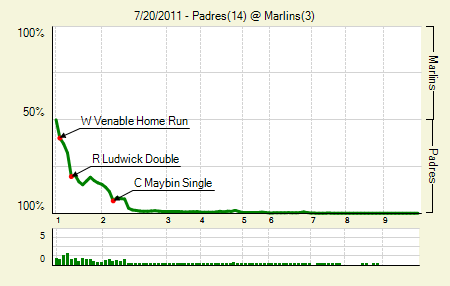 The Padres got one more that inning, but then put up a nine-spot in the second, making this one the snooze-fest that the green line indicates. Jesus Guzman: 3 for 5, 1 2B. He drove in four. And yes, I absolutely typed Juan Guzman, just because it’s what I think when I see J Guzman. Jason Bartlett: 3 for 5, 1 2B, 1 BB. He scored three times. 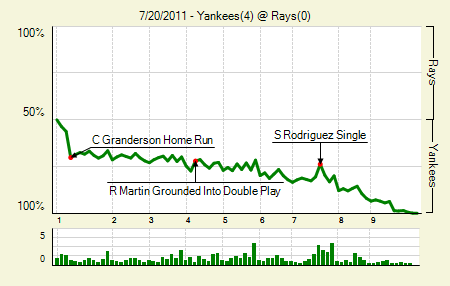 Moving the Needle: Curtis Granderson gets the Yanks started right with a two-run homer, +.140 WPA. The last time the Yankees faced David Price, Derek Jeter went 5 for 5, including 4 for 4 off Price. He wasn’t quite as successful last night, but he did lead off the game with a single. He then stole a base, but it was for naught as Granderson followed with a homer to right, his 26th of the season, to give the Yankees a 2-0 lead before the Rays recorded an out. The Rays threatened at times, but they just couldn’t get the big hit with runners in scoring position. Freddy Garcia: 6.2 IP, 8 H, 0 R, 0 BB, 7 K. He got plenty of swings and misses, something you don’t normally see from Garcia. Three times he got a strikeout with two outs and a man in scoring position. Casey Kotchman: 3 for 4, 1 2B. He’s now officially on the leader boards, as he qualifies for the batting title. Unfortunately, the one out he made was a huge one, a strikeout with two on and two outs in the seventh, with the Rays still within two. Moving the Needle: Eric Thames’s bases-loaded double puts the Jays up by four in the second, +.119 WPA. 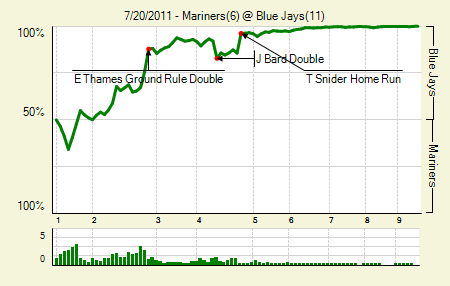 The second inning was not a model for Mariners pitching. The Blue Jays were all over them, singling, doubling, walking, stealing bases — basically, everything but hitting a home run. They got four runs in the inning, the final two coming when Thames grounded one down the third base line and into left. It bounded into the stands for a ground rule double, but I’m not sure the runner from first would have scored anyway. The Mariners did put up a few runs, far more than their season average, but the Blue Jays were relentless. The Mariners have now lost 11 straight and face Ricky Romero today. Travis Snider: 2 for 4, 1 HR. He drove in five runs. He’s the 47th player this year to drive in five or more runs. Ben Zobrist has the 2011 record with eight. Edwin Encarnacion: 3 for 5, 1 2B, 1 HR. He scored four times. Since Dave called for his dismissal he has hit .308/.362/.546 in 141 PA. He’s also 17 for his last 36 with four doubles, a homer, and six walks. 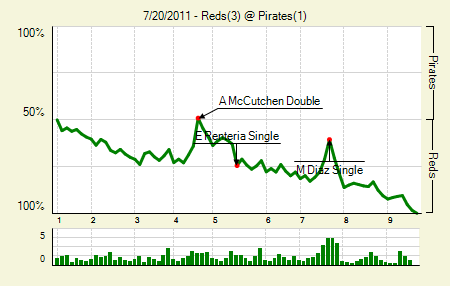 Moving the Needle: Andrew McCutchen gets the Pirates to within one, +.150 WPA. The Reds took a 2-0 lead, putting across a run in the first and a run in the second, both on sac flies. Those will never sit atop the WPA leaders. Instead it was McCutchen, whose fourth-inning double brought home Neil Walker from first and brought the Pirates to within one. That’s as close as they’d get, though, as the Reds picked up another in the next half-inning and held the Pirates in check the rest of the way. Johnny Cueto: 6 IP, 4 H, 1 R, 2 BB, 4 K. He still hasn’t thrown anything resembling a bad start this season. Jeff Karstens: 7 IP, 7 H, 3 R, 1 BB, 1 K. Of course, because of errors only one of the runs was earned. But it’ll keep that ERA looking spiffy! Moving the Needle: Sergio Santos uncorks a wild pitch, allowing the winning run to score, -.360 WPA. Chris Sale had pitched wonderfully in relief, starting with the final out of the eighth and then all the way into the 11th. He got the first two outs of the inning, but then gave up a walk and a single to put runners on first and third. He’d already faced more batters, 14, than he had all season, and so Ozzie Guillen went to his closer, Sergio Santos, to get the final out. On a 2-1 pitch he threw a breaking ball in the dirt, and it actually induced a swing from Billy Butler. Unfortunately, it also got away from A.J. 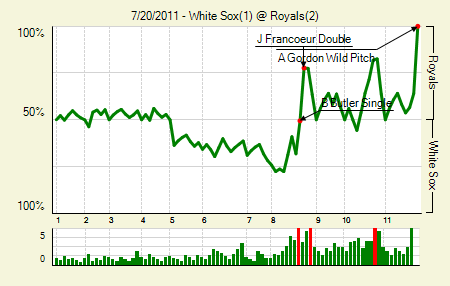 Pierzynski, far enough that Alex Gordon scored the winning run from third. John Danks: 7 IP, 5 H, 0 R, 1 BB, 6 K. He had experienced some rough times earlier in the year, but he was starting to come around just before he went on the DL. His numbers are starting to look an awful lot like his career ones. Bruce Chen: 8 IP, 4 H, 1 R, 1 BB, 4 K. Interesting but meaningless: he has allowed either one or four runs in each of his starts since returning from the DL. 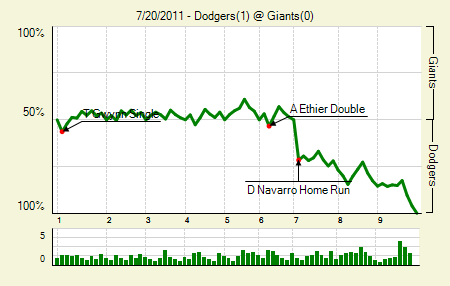 Moving the Needle: Dioner Navarro plays the unlikely hero with a homer, +.215 WPA. He might be a former top prospect, and he might have had a good season when the Rays made their run in 2008, but there is no getting around the fact that Dioner Navarro is terrible. But he came through in this one, socking a mistake pitch into McCovey Cove. That’s what a Linecum-Kershaw duel should come down to, though. It makes it all the better entertainment. Tim Lincecum: 7 IP, 5 H, 1 R, 4 BB, 7 K. He worked around the walks perfectly fine. If only he hadn’t left that pitch up and out over the plate to Navarro. If only. Clayton Kershaw: 8 IP, 3 H, 0 R, 1 BB, 12 K. That is the definition of mowing ’em down. He has 61 strikeouts in his last six starts (47 IP). Moving the Needle: Howie Kendrick completes the comeback with a bases-loaded single, +.340 WPA. In the fifth it appeared as though the Rangers would extend their winning streak to 13. With the game tied at three they smacked six hits, two of them doubles, on their way to a five-run frame. Derek Holland set them down in order in the bottom half, but then he ran into trouble in the sixth. 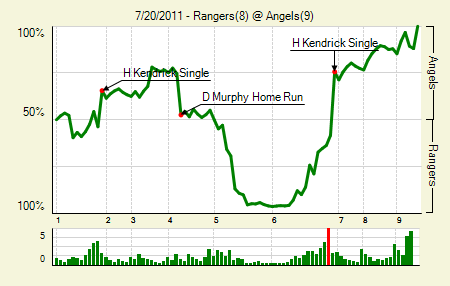 The Angels put on their own singles and doubles show, scoring four before they loaded up the bases for Kendrick. On the first pitch Kendrick laced one in the gap, scoring two runs and giving the Angels a 9-8 lead. He drove in four on the game. Erick Aybar: 2 for 5, 1 2B. He’s almost completely stopped walking, but he’s flashed some power this year. It’s not ideal for a leadoff hitter, but at least he’s producing something, unlike last season. Michael Young: 3 for 5, 2 2B. He’s currently combining his 2010 power with his 2004 walk rate with his 2009 BABIP. It’s added up to a fine season — in fact, his 130 wRC+ is equal to his 2009 mark, despite having a wOBA nearly 20 points lower. 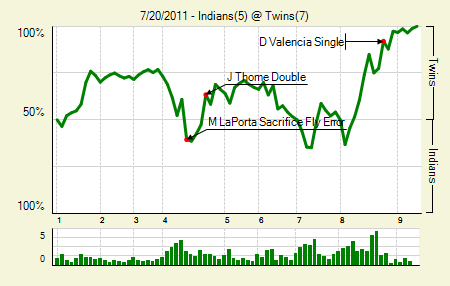 Moving the Needle: Carlos Gonzalez drives home the winning run, +.379 WPA. The Rockies were inching toward a 2-1 victory, but they blew it in the eighth. Jordan Schafer reached to start the inning, but then the next two men made outs. So what did he do? He stole second. Which was damn fortunate, because it allowed him to score when Dan Uggla lined one to shallow center. The score remained tied into the bottom of the ninth, but it wouldn’t end that way. Eric O’Flaherty got the first two men, but then Martin Prado let a ground ball get by him. That allowed Dexter Fowler to reach second. 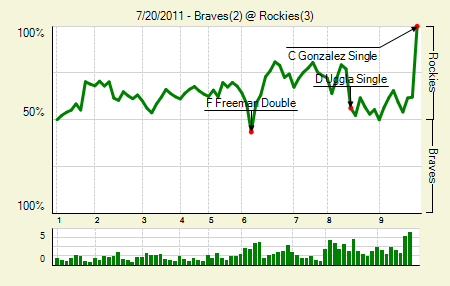 And so the Braves intentionally walked Ty Wigginton to get to…Carlos Gonzalez. I get the platoon advantage and all, but really? In any case, Gonzalez made them pay for their decision, lining one to right and ending the game. Juan Nicasio: 7 IP, 5 H, 1 R, 1 BB, 4 K. The walk was intentional. It’s tough to ask more from a 24-year-old rookie. Through 10 starts he has an ERA just under 4.00, and a SIERA in the mid-3s. Tim Hudson: 7 IP, 5 H, 2 R, 1 BB, 5 K. He has nearly identical ERA/FIP/xFIP/SIERA. 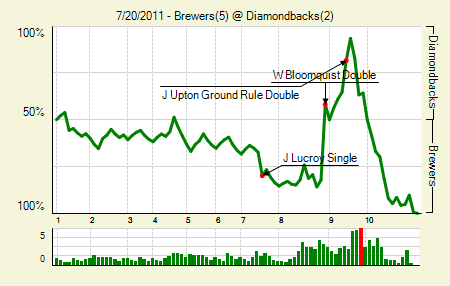 Moving the Needle: Willie Bloomquist brings the DBacks back with a two-run double, +.403 WPA. You see the chart, so you know what came after. But for a while Bloomquist was the hero in Arizona, as his double into the left-center field gap brought home two base runners and tied the game at two in the eighth. That sent it into extra innings, though the Brewers took over from there. A single, walk, and balk set them up with runners on second and third with none out, and three singles brought home the go-ahead run and some insurance. Ryan Braun: 3 for 5, 1 2B, 1 HR. Can you tell he was missed while he nursed his hamstring injury? Chris Narveson: 7 IP, 4 H, 0 R, 0 BB, 4 K. He must have been repeating Scott Boras’s mantra after K-Rod blew the lead: closers don’t make good setup men. We hoped you liked reading The Morning After: Game Recaps for July 20th by Joe Pawlikowski! I am so very, very done with White Sox baseball. For about the fourth time this year. Ok, I was done with it last year too, and the year before that, and pretty much any year they’ve had those terrible announcers. I’d rather watch Grey’s Anatomy than listen to those guys.